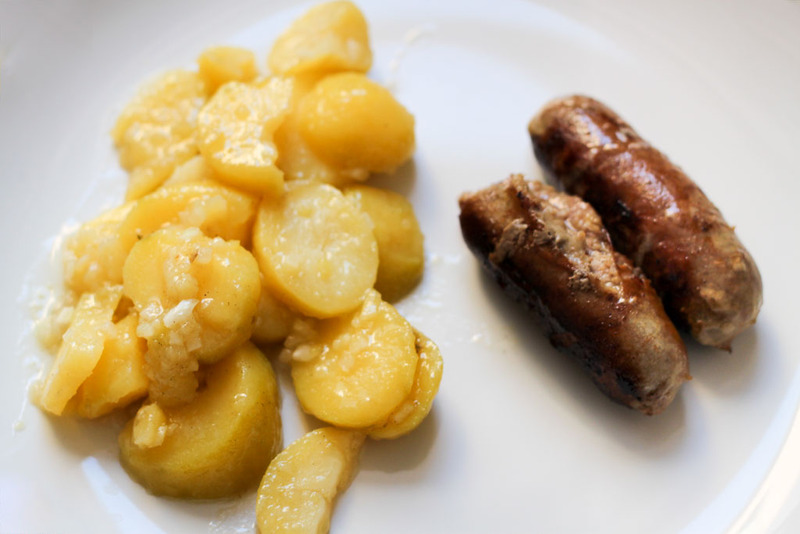 The Wurst – Eat Me. Drink Me. Intestines smell. Terribly. I’m not exactly sure what I’d been expecting, but it certainly wasn’t the heady, pungent stench of a hound’s breath whiffed with rotten bone. 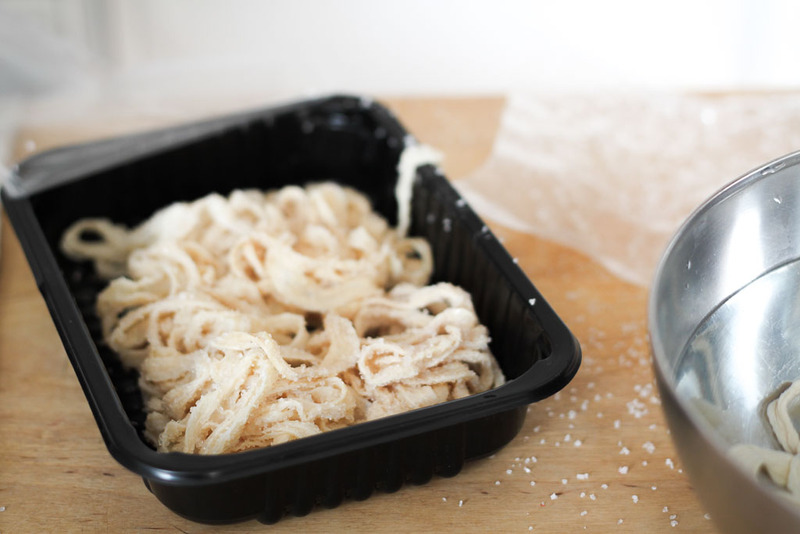 However washed and dried and packed in salt they might be, intestines smell like what they are: long, stringy coils of an organ that once held yards of mulching food on its way to less pleasant places. 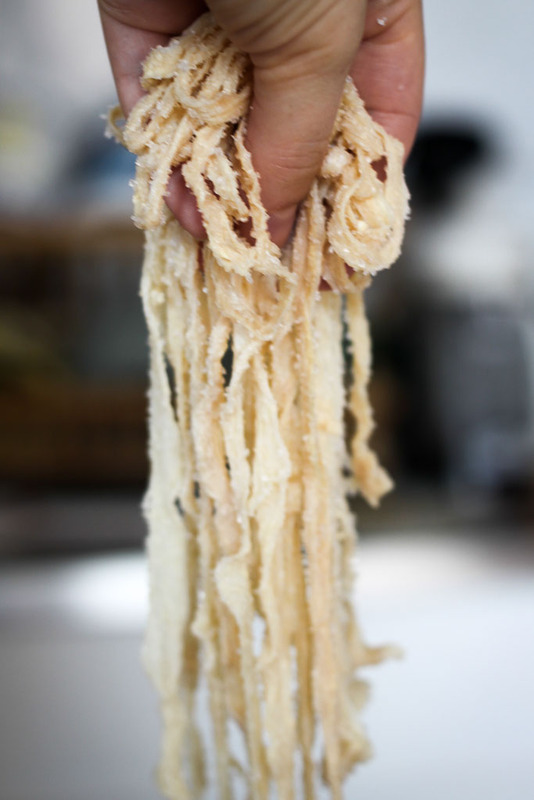 And yet, there I stood at the kitchen island, disentangling about seven meters’ worth of pig intestines. I was oddly reminded of the matted bundles of jewelry my grandma used to set aside for me. My nimble fingers were expert at parsing apart delicate gold links and unwinding them from multi-colored baubles. I never imagined the skill would come in handy here, as I gently tugged a knot out of the intestine, sending grains of coarse salt scattering across the floor. 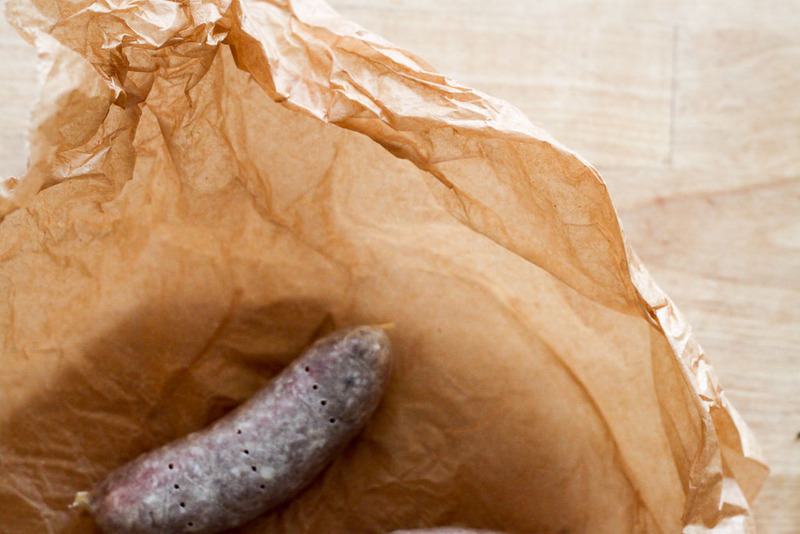 Making your own sausages isn’t necessarily hard, but there are a lot of moving parts involved. And equipment. 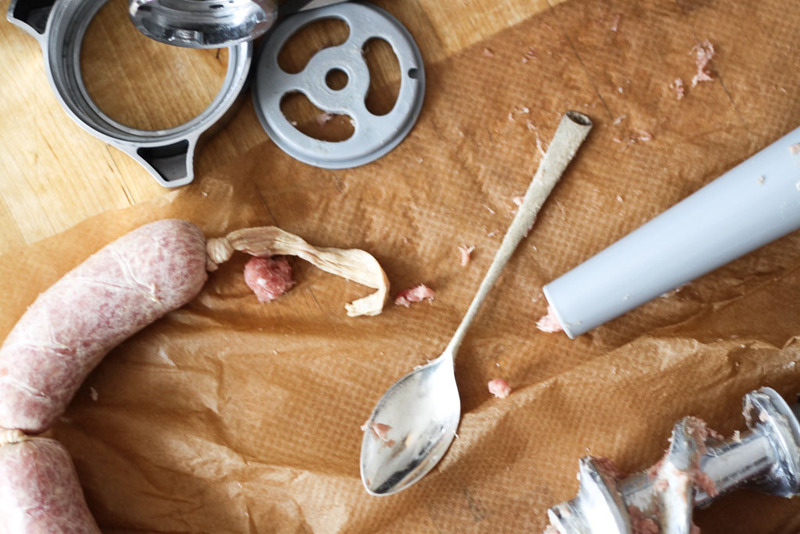 You have to have a meat grinder and a stuffing horn and probably a freezer that’s bigger than the crystal-filled icebox wedged at the top of my tiny European fridge. And it’s definitely a two-person job. 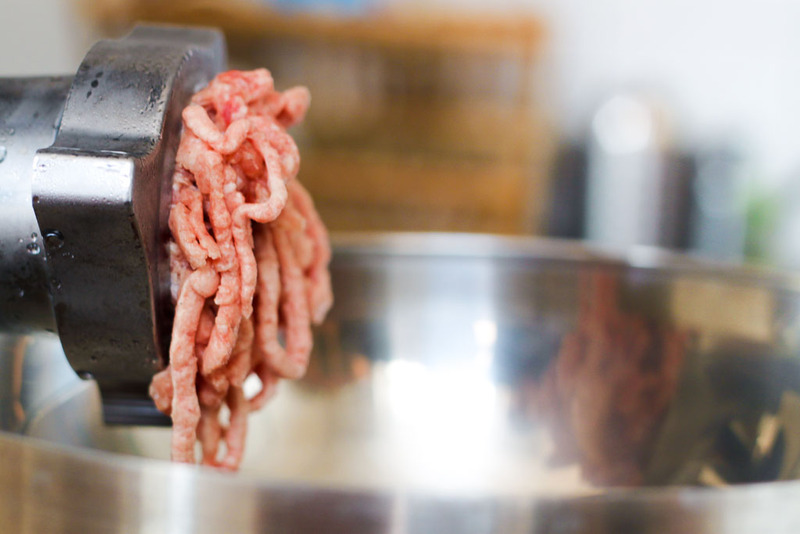 The meat grinder is an unwieldy beast, and one person must feed the chunks of meat into the machine, while the other keeps the red rainbow-strands flowing evenly into the bowl. After the dry-rubbed meat is ground once, it’s flash-frozen, then ground again with a finer dice before being whisked into the freezer once more. Finally, it’s mashed into a pinkish pulp by hand and worked with a glut of rich cream. 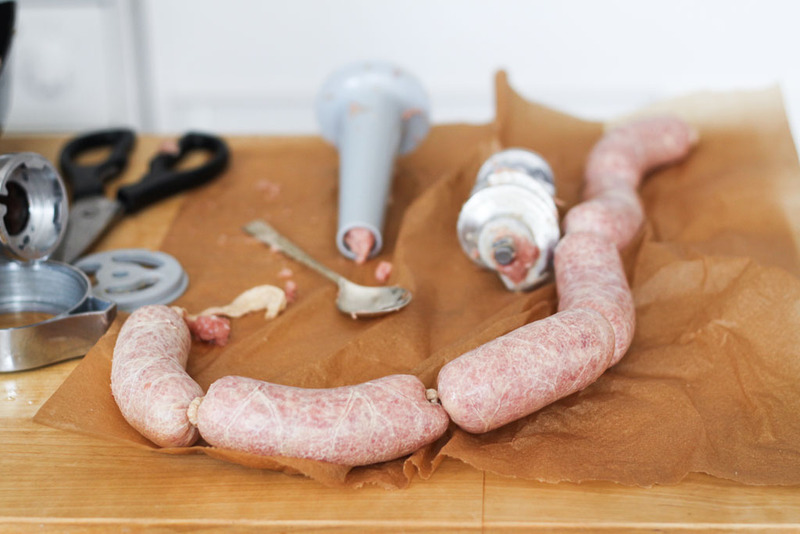 Before you even begin to stuff the sausage, you must check the intestines for integrity. 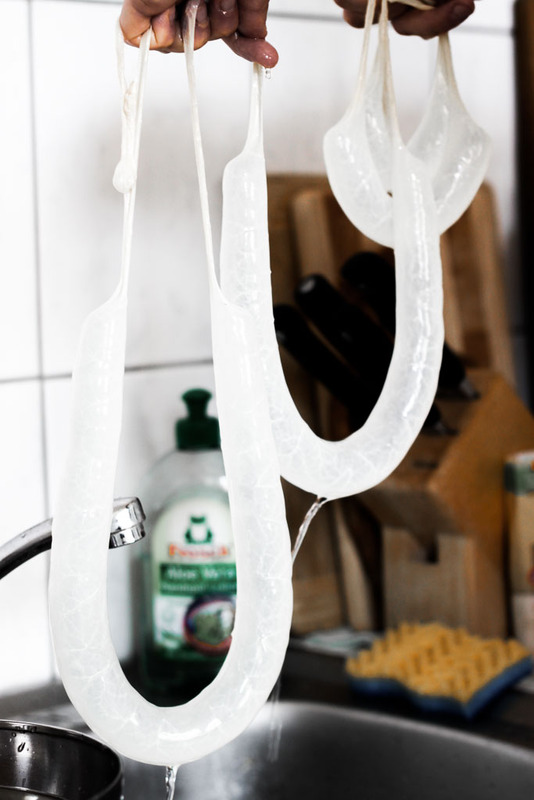 This involves wedging one end up to the faucet like a water balloon’s lip, and watching as the long tube fills, pale and eerily veined like ghost leaves. Then you lift the intestine up into the air, checking for punctures by looking for fierce little spurts of water. These sections are snipped out, so the casing doesn’t burst as it’s being filled. Ah, casing. What a pleasant word that is. Let’s use it from now on, discarding the word “intestine” like the musky water it’s been softening in for hours. 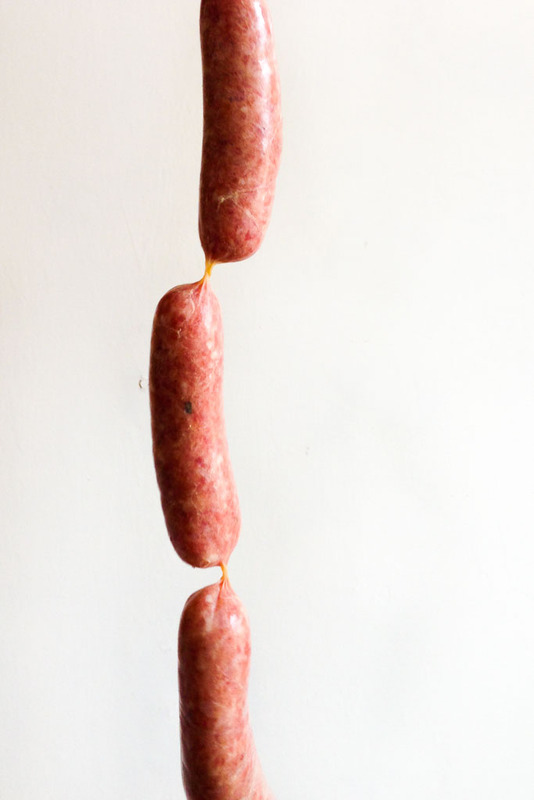 If you think it’s easy to make randy jokes about sausages, you’ve never made your own. At times, the adventure had Anna – my bonny sausage companion – and I doubled over with laughter like prepubescent 12-year-olds at a co-ed mixer. It’s too easy to make jokes, and so I won’t, not here, where we only discuss serious endeavors. 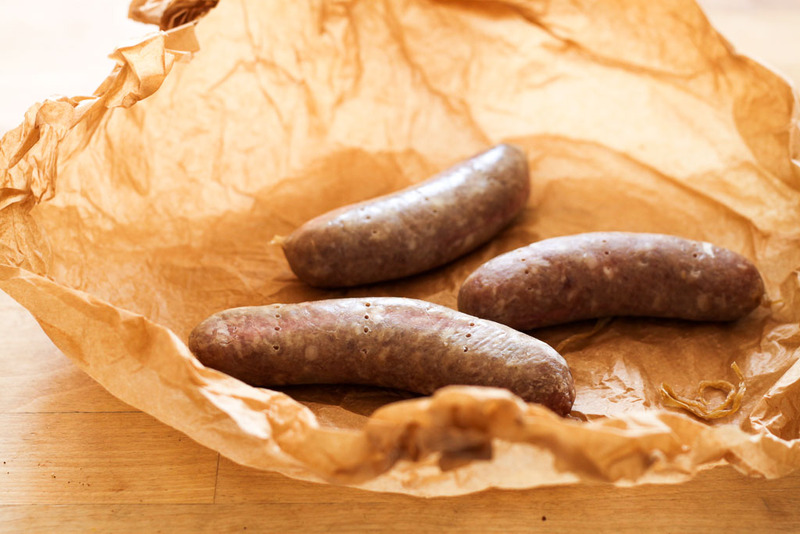 Like the cautious surprise we felt at frying up a sample taste of our bratwurst blend, brightened by home-grown lavender and crushed fennel seeds. Like gradually finding the right rhythm for pushing meat through the grinder and into the waiting casing. 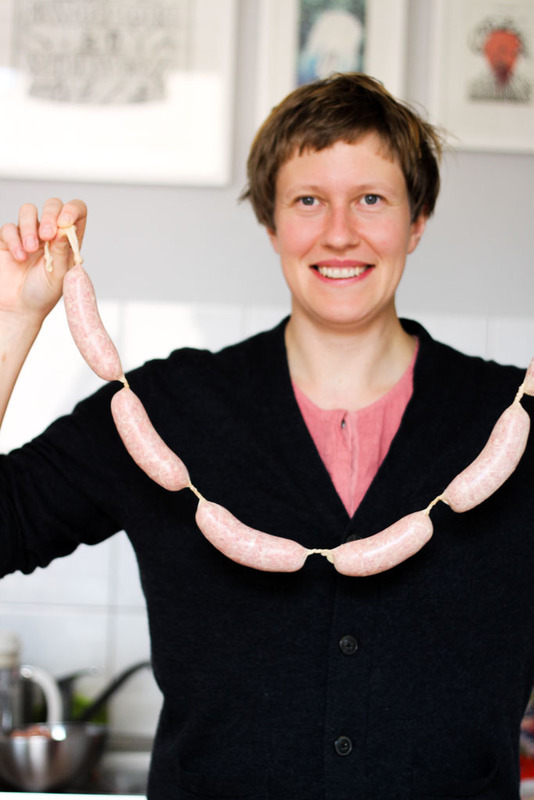 Like knowing when to twist the link and smiling at the chain of tiny, meaty grins. 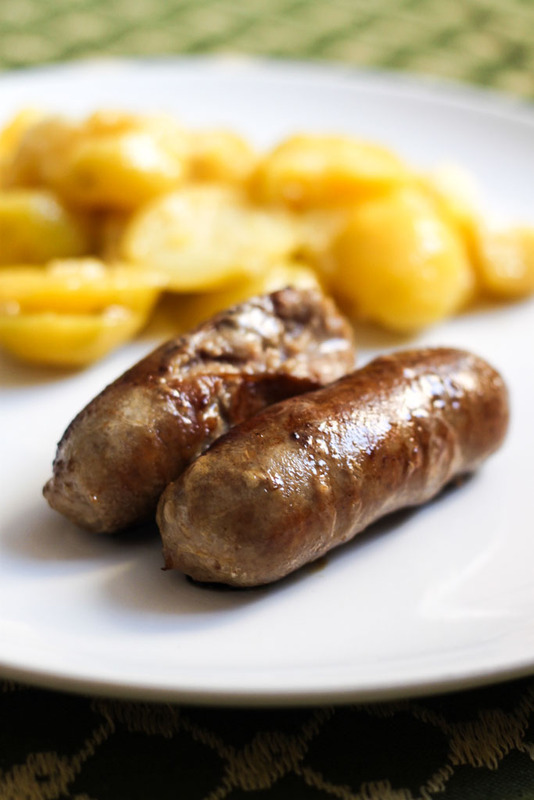 I think it’s fair to say we weren’t expecting to end up with anything resembling real sausages, not the kind you buy at a butcher’s shop, plump and red and marbled with white fat. But there they were: sixteen links ready to fry in a hot skillet. It’s also fair to say that I ate a lot of sausages, because I didn’t want to share. I sent Anna home with half, of course, but hoarded the rest, judiciously measuring out two sausages a meal. Two beside a bed of eggs and spinach for breakfast, two with chickpeas and arugula for lunch, two with vinegary German potato salad for dinner. And the last two at midnight, alone, with nothing but thick swipes of Dijon from the jar. Never have sausages seemed so enticing! 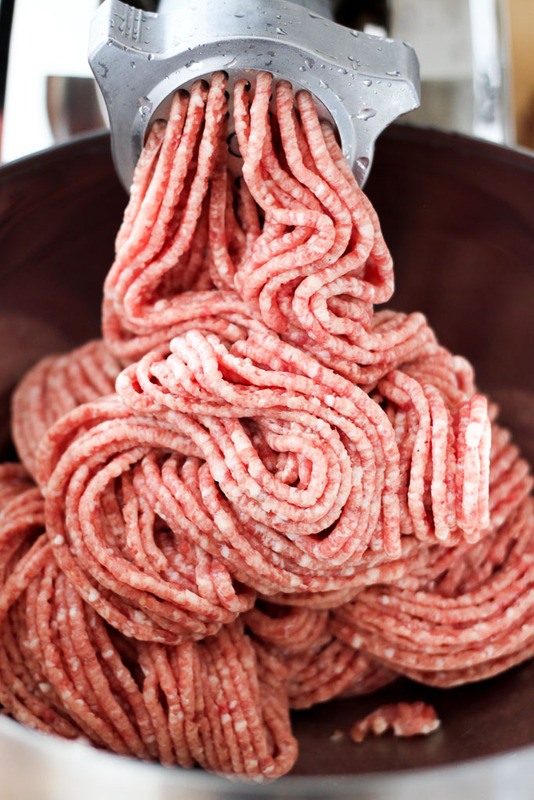 As a young boy, my grandfather used to take me with him to select the meats for making sausage, and set me down at the table to observe the process. I would guess, he learned this art form from his step-faither, and he would season it what I know today as Sweet Italian. Many of your recipes I have tried at home, but this will not be one of them. Sounds delicious, but at my age, more involved than I like. I always enjoy seeing EatMeDrinkMe in my email list, so please keep them coming!